Our 1 1/2 lb. 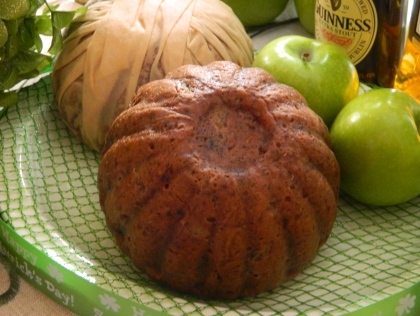 Guinness Irish Applesauce Cake with Bushmill Irish Whiskey has a robust flavor of cinnamon and apple. This is one of our moistest cakes! This moist applesauce cake is made with Guinness Extra Stout beer, walnuts, golden raisins and dates. Steamed in a dome shaped mold and sprayed with Bushmill Irish Whiskey. Suggested gourmet sauce recipe included for your convenience.